Sun Shangxiang has infiltrated Cao Cao's camp and she has been secretly noting details and sending them via a pigeon to Zhuge Liang. Meanwhile, Cao Cao's army is seized with a plague of typhoid fever which kills a number of his troops. Cao Cao cunningly orders the corpses to be sent to the allies' camp, hoping to pass the plague on to his enemies. 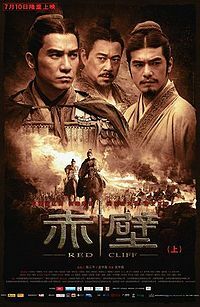 The allied army's morale is affected when some unsuspecting soldiers let the plague in, and eventually a disheartened Liu Bei leaves with his forces while Zhuge Liang stays behind to assist the Eastern Wu forces. Cao Cao hears that the alliance had collapsed and is overjoyed. At the same time, his naval commanders Cai Mao and Zhang Yun propose a new tactic of interlocking the battleships together with iron beams to minimize rocking when sailing on the river and reduce the chances of the troops falling seasick.